Caving in Stockport! What's this all about? The DCC was founded by cavers based in the Stockport area and there are still strong connections between the Club and the town. The Club meets regularly in the Pack Horse in the Market Place, has staged expeditions at the museum and taken part in Stockport Carnivals. 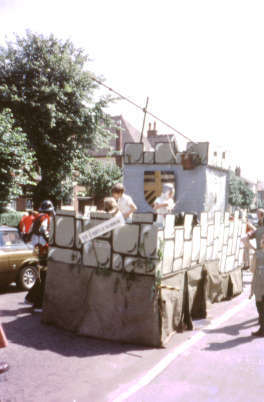 The picture on the right shows the mediaeval castle that was entered into the carnival in 1973. However, there is more to Stockport than appears on the surface and the Club has also taken an active interest in the underground history. 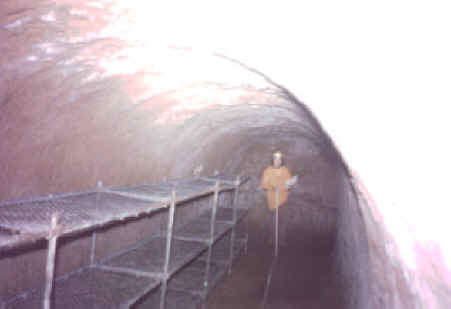 In the 1970s, access was possible to the three main air raid shelters at Brinksway, Chestergate and Dodge Hill. Members made maps of the shelters which are reproduced in miniature below. Research was carried out into the history but the project was allowed to lapse when interest in Alderley Edge grew. The shelters were dug by contractors in the late 1930s when war became likely and were able to house up to 5000 people when required. Each block has multiple entrances, decontamination areas, beds and toilets - some of which are still in place. In the early 1990s, Chestergate Shelters were re-opened to the public as a place of historical interest. More information can be found in the local magazine "Stockport Heritage" (Number 12) published in 1990. The air raid shelters at Dodge Hill. Surveyed by DCC members in 1975. The air raid shelters at Chestergate. This survey was made in 1975 before the shelters were opened to the public. The long 'straight' passage runs under St Petersgate. The air raid shelters at Brinksway. There were several entrances along the main road and adjacent to Lark Hill. Brinksway Shelters showing bunks in place. The picture was taken while the map was being made. In the same issue of the magazine, there is an article about the tunnels that fed water to the power station built at Portwood. A survey was completed in 1957 which shows the extensive tunnel network used to feed water to water mills around Warren Street which were re-used to feed water to the power station. What is the state of the tunnels now? No doubt the council still have access to them and keep them in good enough condition to prevent subsidence. Another fertile area for cavers lies in the conduits which carry the streams and rivers down to the Mersey. One is known to run down Hillgate. Perhaps one of these days we will get to explore these too. Of course the longest tunnel, or is it the widest bridge, is the Merseyway Shopping Centre which spans the river Mersey for a considerable length from Mersey Square to Lancashire Hill.. Things are on the move now in, or should it be under, Stockport. The DCC has joined in a project being proposed by Stockport Heritage Trust to bring together all the knowledge about Underground Stockport. The project is in an early stage but if anyone wants to know more about it or feels that they have something to contribute, they could e-mail to the Recorder. More about the Stockport Heritage Trust can be found by clicking HERE to link to an introduction to the Trust or HERE for their website. If you are not a Stopfordian, you may not know where Stockport is. Stockport lies 10 miles south of Manchester, UK and spans the river Mersey. The Mersey starts at Stockport being formed out of the Rivers Tame and Goyt which run off the Derbyshire hills. It is the Goyt which feeds most of the water to the mill tunnels. The town is built on Triassic sandstone bluffs which overlook the river from north and south. The older part of the town, and most of the tunnels referred to above, are south of the river.